The sense of hearing enables us to effortlessly and precisely pinpoint the sounds around us. Even in total darkness, listeners with normal, healthy hearing can distinguish sound sources only inches apart. This remarkable ability depends on the coordinated use of sounds at the two ears, known as binaural hearing. Binaural hearing helps us to discern and learn speech sounds as infants, to listen to the teacher’s voice rather than the chatter of nearby students as children, and to navigate and communicate in a noisy world as adults. For individuals with hearing loss, these tasks are notoriously more challenging, and often remain so even after treatment with hearing aids or other assistive devices. Classrooms, restaurants, and parties represent troublesome settings where listening is effortful and interrupted. Perplexingly, some individuals that appear to have normal hearing (as assessed with an audiogram, a common test of hearing) experience similar difficulties, as if the two ears are not working together. Such binaural hearing difficulties can lead to a diagnosis of Central Auditory Processing Disorder, CAPD. CAPD is defined by auditory deficits that are not explained by typical hearing loss (as would be seen on an audiogram), and indicates dysfunction in the auditory brain. Prevalence of CAPD has been estimated at 5-20% in adults and ~5-7% in children. Interestingly, CAPD is especially prevalent in children that have experienced frequent ear infections during the first few years of life. Ear infections can lead to a temporary conductive hearing loss from the buildup of fluid in the middle ear (called otitis media with effusion) which prevents sound from reaching the inner ear normally. For children who experience repeated ear infections, the developing auditory brain might receive unbalanced input from the two ears for weeks or months at a time. While infections generally dissipate later in childhood and the audiograms of both ears return to normal, early disruptions in auditory input could have lasting consequences for the binaural centers of the brain. We hypothesized that persistent conductive hearing loss (such as that caused by ear infections) disrupts the fine-tuning of binaural hearing in the developing auditory system. Using an animal model (the guinea pig), we found that chronic conductive hearing loss during development (induced by an earplug) caused the brain to generate an altered representation of auditory space. 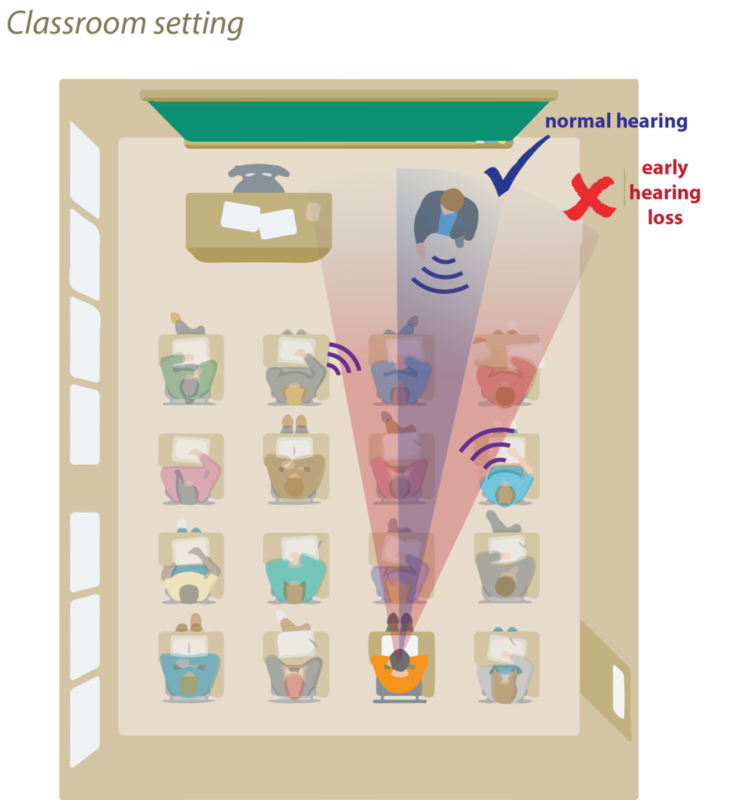 When the hearing loss was reversed by simply removing the earplug, the brain misinterpreted the normal sounds arriving at the two ears and the animals consequently pinpointed sounds less precisely; in fact, animals were ~threefold worse at a simple sound location discrimination task than animals that had not worn earplugs, as if the sense of auditory space had been blurred. These results provide a model for CAPD; a child with CAPD may struggle to understand a teacher because a less precise (“blurry”) representation of sound location in the brain makes it difficult to disentangle the teacher’s voice from competing sounds (Figure 1). Overall, the results suggest that experiencing even temporary hearing loss during early development can alter the normal maturation of the auditory brain. These findings underscore the importance of early detection and treatment of hearing loss. Figure 1 caption: A typical classroom is an acoustically complex environment that can be difficult for a child with CAPD. Children with normal binaural hearing (blue shading) can separate the teacher’s voice from background noise sources, but those with impaired binaural hearing (red shading) may have a much harder time accomplishing this task.